A fast ferry passing us at 34 knots! Look quick or he will be gone. The ruins of Asklipieion on the Greek island of Kos. 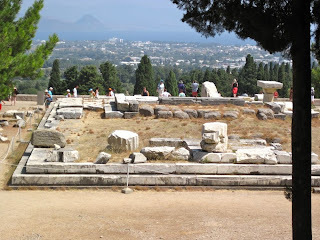 This is where Hippocrates, the daddy of modern medicine, taught in AD 550. Same ruins of Asklipieion with Turkey in the background, across the sea. 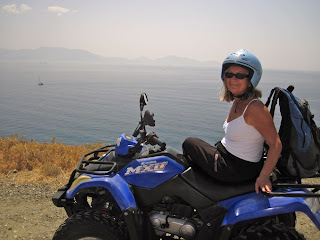 This is how to explore a Greek island! Typical beach on Kos. The view is free but the umbrellas and 2 chairs cost about $5. 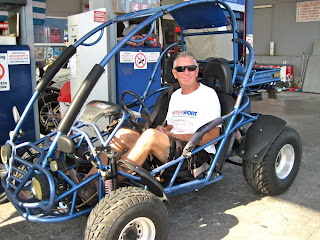 Captain Steve's way of zooming around the Greek islands. The dune buggy shakes every part of your body and you feel it for days afterward! 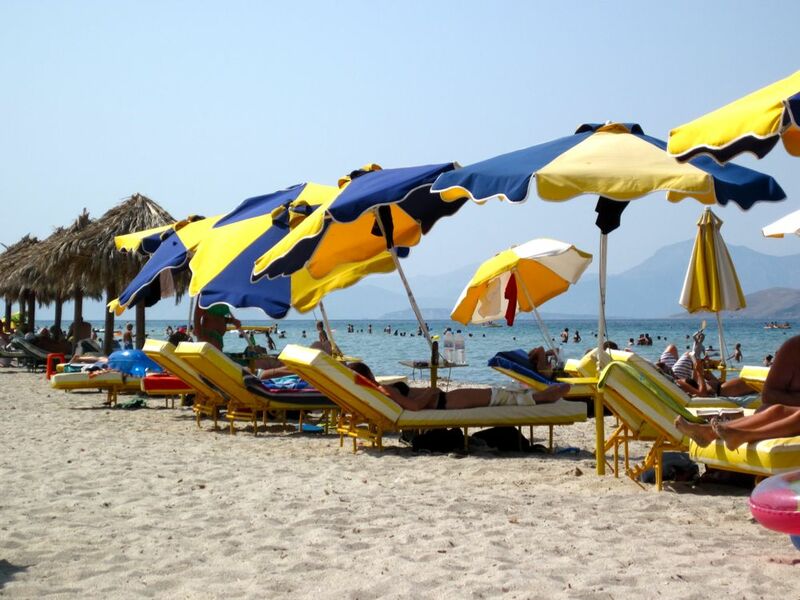 Paradise beach on the island of Kos. Just spectacular! 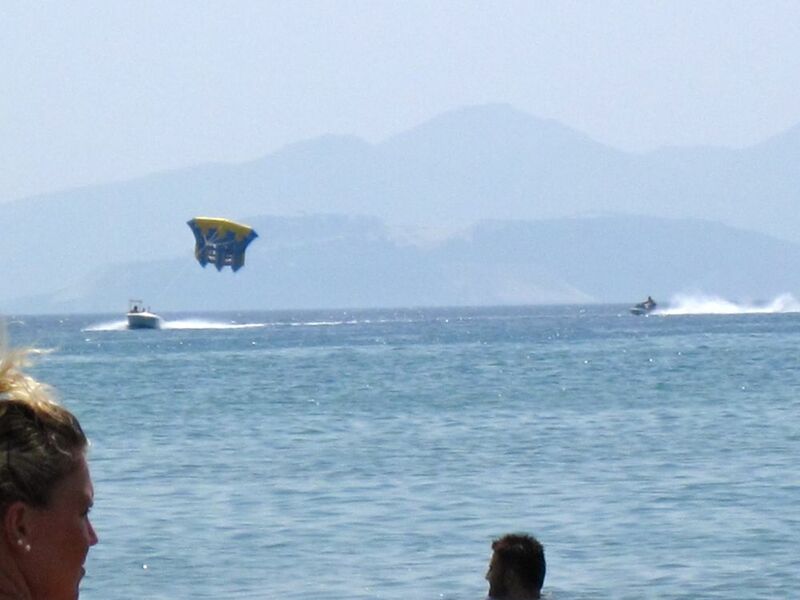 There are 4 people in that flying float. I don't think this is legal in the US? Another beach on the island of Kos. Our neighbors on Paros. The helicopter is a nice toy! This is Phoenix 2. 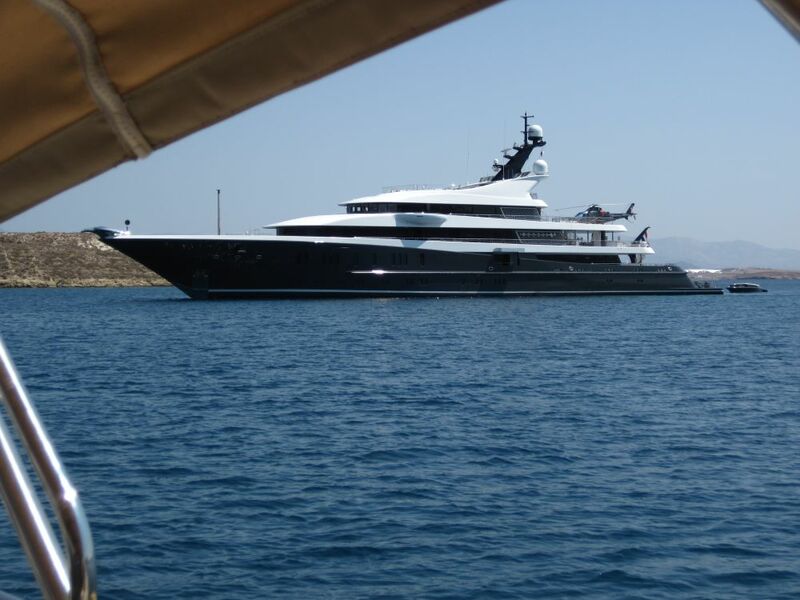 A better view of our neighbors at anchor at Paros. Ask any sailor who has sailed the 7 seas and they will tell you about the 3 T's, or better known as the three best places in the world to visit and sail. It just doesn't get any better than those three places to visit in the entire world. The people are friendly, the scenery is unsurpassed and life is the best in the 3 T's. So now we are in G for Greece. Hmmmmm. 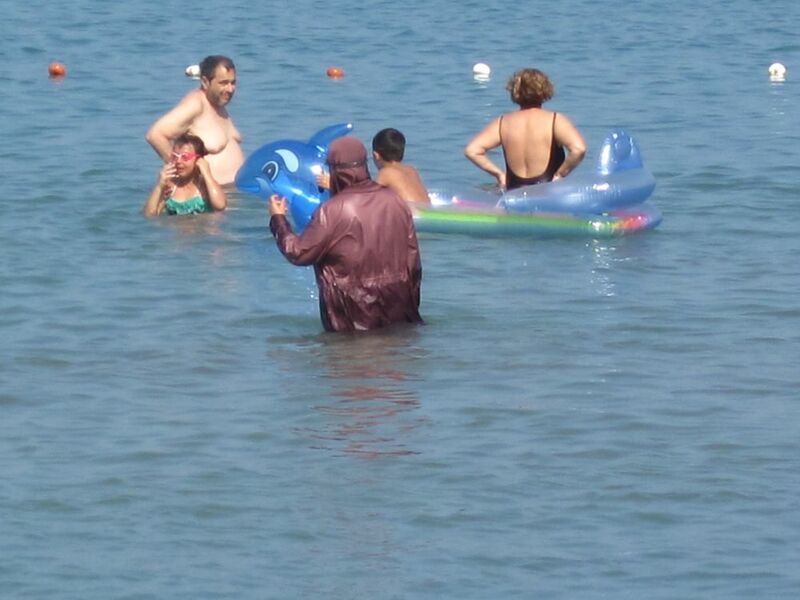 It is fitting that the great philosophers came from Greece. The people here tend to be very thoughtful nearly all of the time. They love to think about life and live life to the fullest. The concept of work is pretty remote for them, that is why Socrates, Plato, Aristotle and oh so many other great thinkers came from here! They must have loved contemplating things like, if a tree falls in the forest with no one around does it make any noise? 3 to 4 hours for their lunch break is common, as we talked about last year. Shops are closed and the only things open are the restaurants that are brimming with people. Come 5 or 6 pm, life begins in earnest in the little windswept and sun drenched islands of Greece. 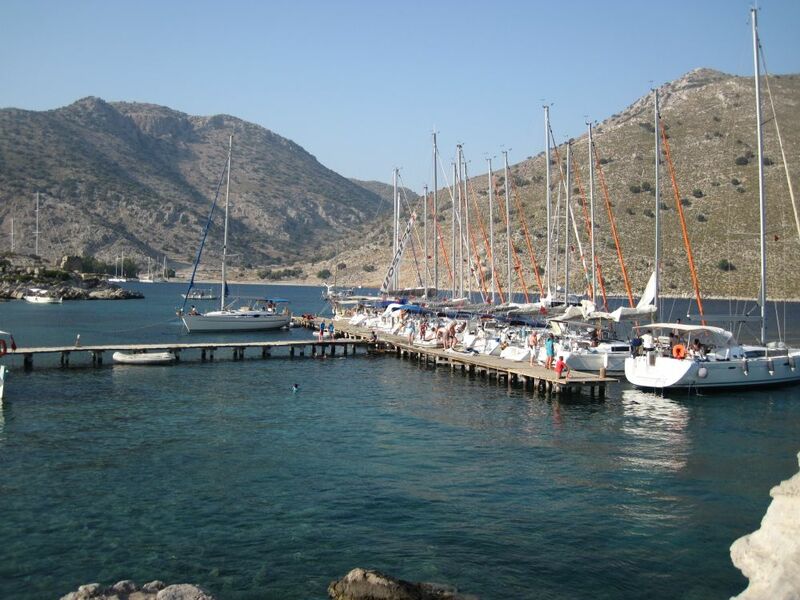 Can't you just picture the Ouzo flowing around the harbors?!? 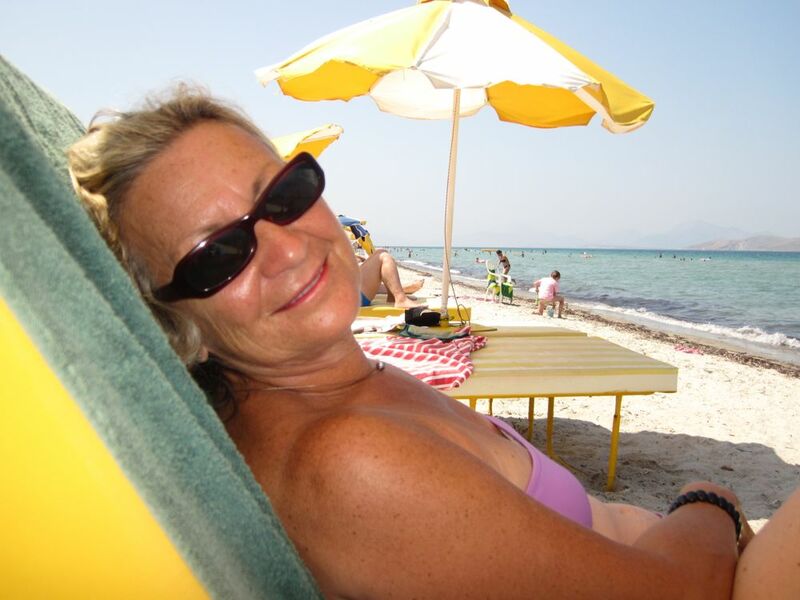 We had planned to go to an island called Paros. But half way on our journey the meltemi decided to start blowing. That is a Greek word for devil wind, we think. Well, Captain Steve decided that trying to sail into those nasty 30 knot winds and 9-12 foot seas and bash our brains out was not good, along with Admiral Maria's verbal thoughts, and instead we altered course to fly down the large seas at 9.5 knots and head for a different island altogether. Dhenonssa. 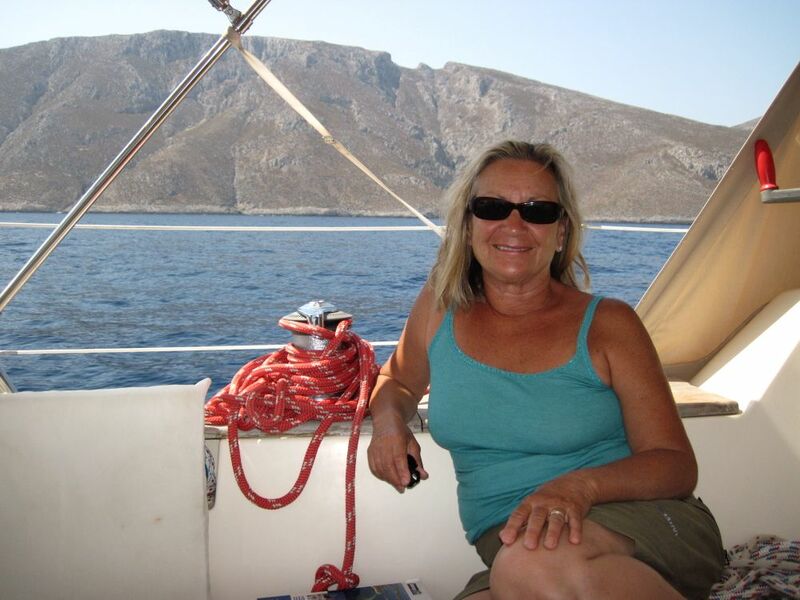 Ah yes, weather bound at a small Greek island with Aspen the only boat in the bay and right next to a spectacular sandy beach with a taverna to eat at. 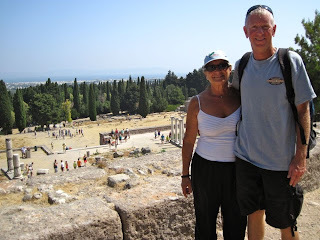 Only Greek Athenia tourists have found the island so far so everything is very laid back and peaceful. Peaceful except that the beach music keeps going until 4 AM but we have fans to block out the noise! So after 2 days of sunburn the weather cooperated and off we went again. 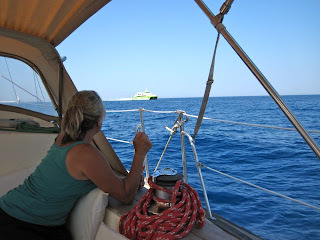 Today we finally anchored in Paros and who do you think decided to anchor right behind us? 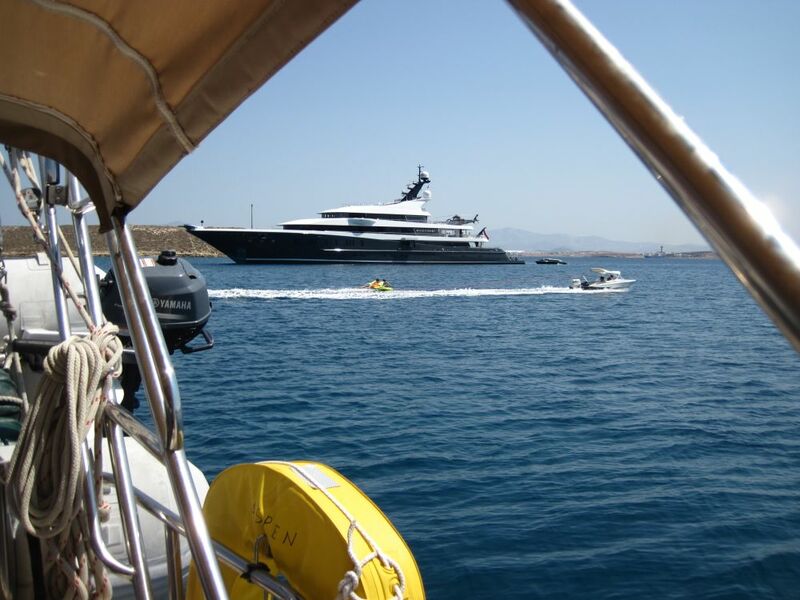 Some Mega Yacht with a helicopter on board called Phoenix 2. The people onboard look friendly since they waved at us with their guard boat hovering very close by. Don't you wonder who is on it? Turkey - What a Place! Bozukkale, Turkey anchorage. Aspen is on the far end, 2nd from the end. Lots of boats on a small dock! 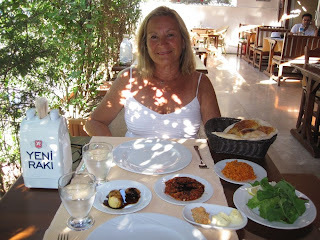 The fantastic restaurant at Bozukkale. The mezes were to die for, according to Admiral Maria! 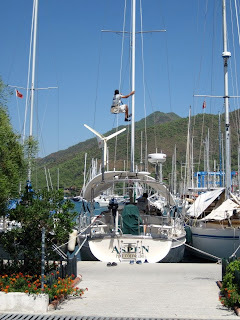 Marmaris, Turkey. 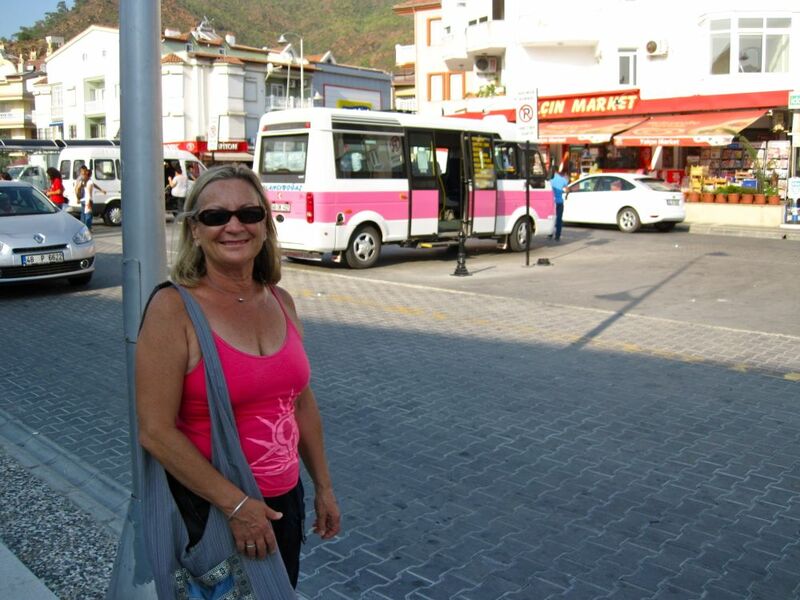 Waiting for our pink bus in the background to take us from town back to the marina. We are motoring and the gullets come by close and fast near us! The Admiral seems to have found something to buy - funny how that always happens! Typical beach scene in Datca, Turkey. You see everything here. 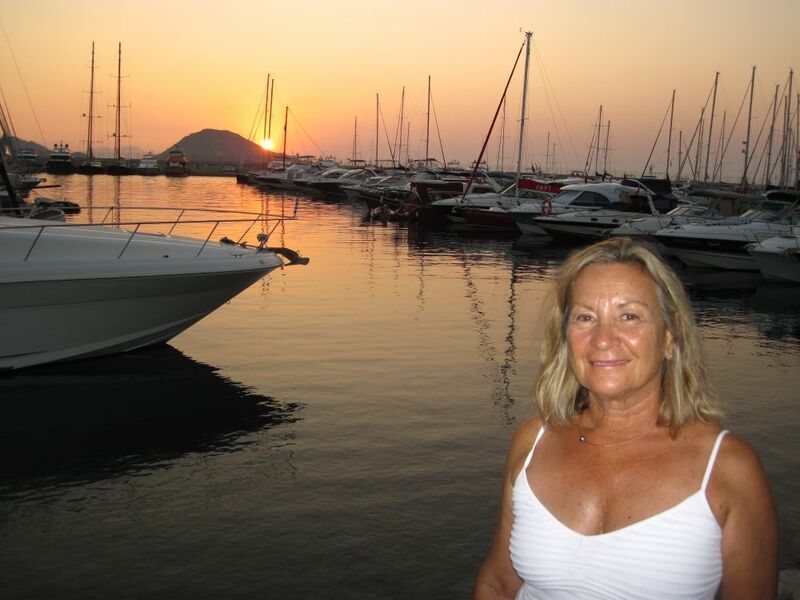 Sunset in Turgutreis, Turkey at D-Marin marina. That rounded hill on the horizon is Greece! the new moon showing her face. in a most unlikely place." The wailing from the mosques pierces the quiet air at the beginning of each new day. Yes we are back in the Islamic world, Turkey to be exact. Yet life is more moderate and religion is not as fervent here as in other parts of the region like Oman and Palestine or other places like that, thank goodness! Yes there is unrest in parts of Turkey but where in the world can we find stability these days? 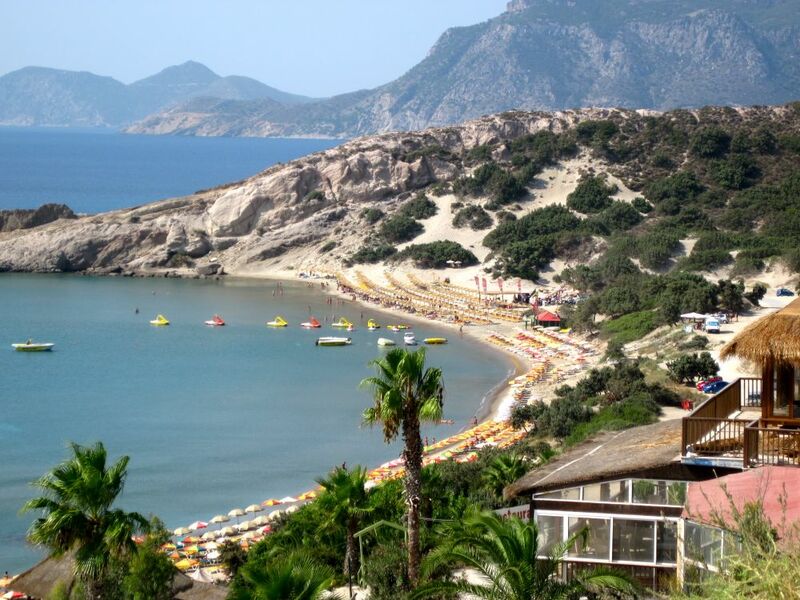 There is no question about our safety here and we think Turkey is one of the best places on the planet to visit, especially to see the ancient historical and archaeological sites dating from prehistoric times right through the dark ages, including World War I and II. But it is time to leave this magical land as the sea is calling us once again. Greece lies 6 miles away on the horizon and it is there we will enter the EU and continue to sail westward. How do we choose where to make landfall in a country since we are on a sailboat? In a plane everything is set and you fly into an international airport and enter a country. Simple. But in a boat things are much different. We have to make our first landfall in a place that has customs and immigration to greet us (hopefully they are friendly) and allow us into their country after doing a whole lot of paperwork. 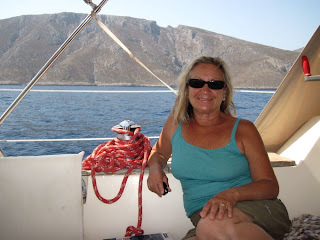 We have 2 choices for Greece that are closest to us: The islands of Simi and Kos. 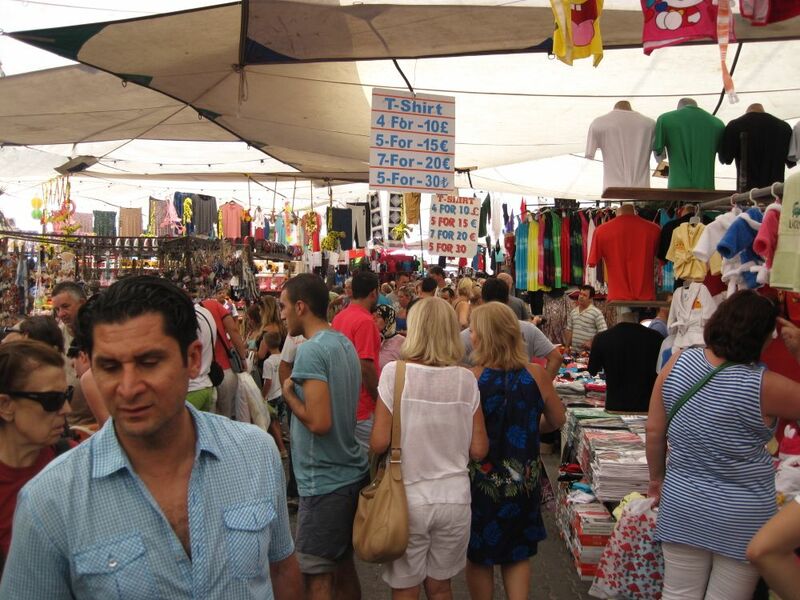 Simi is a small island but the harbor is very crowded and the agent fees for our paperwork are very expensive. Instead we chose the island of Kos where the agent fees are much less and there is a marina to stay in. 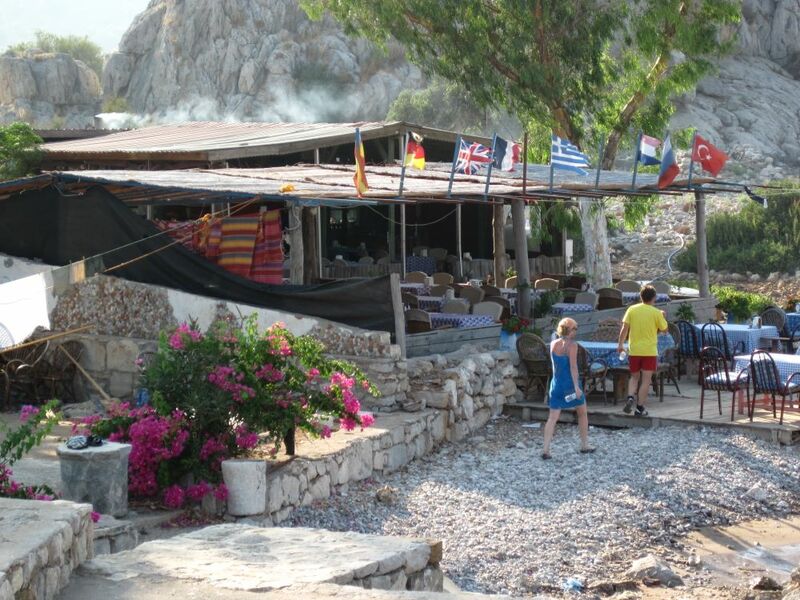 Even Kos has problems because the only marina is full of charter boats. 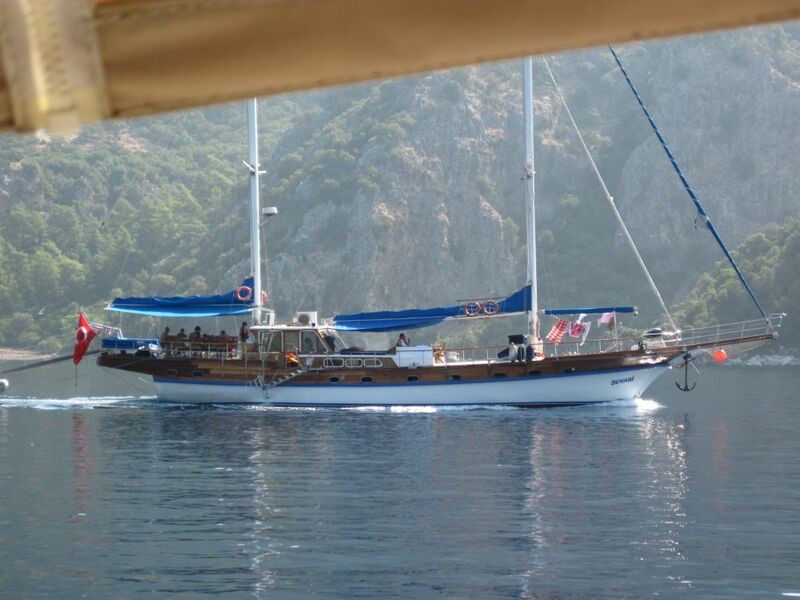 There are over 100 charter boats and no room for wandering sailors. However, we just have to pick our window. In this case we wait for the charter boats to leave on Monday morning and we can have the marina to ourselves until Thursday. After that the boats come back like homing pigeons looking for the nest and we must leave. 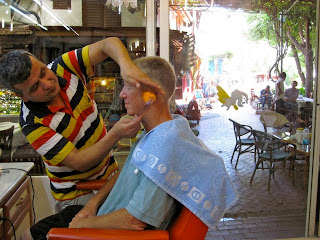 Time for another Turkish haircut and of course the burning of the flame - that is so hot! Admiral Maria loves watching! Taking a break from all the work on Aspen and trying to cool off in a Turkish Bath? 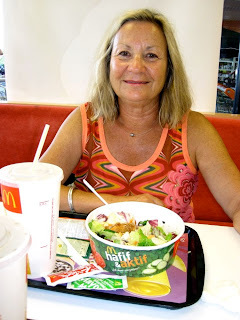 Turkish McDonalds and the big salad that Maria likes. The McDonalds has air conditioning! The guys working on our rigging in the marina. We like that the mast stays upright on the boat! Cleaning as usual under cloudless skies. The temperature is 105 degrees in the shade! Another dinner of mezes - they are so good! Well maybe the Raki helps too? 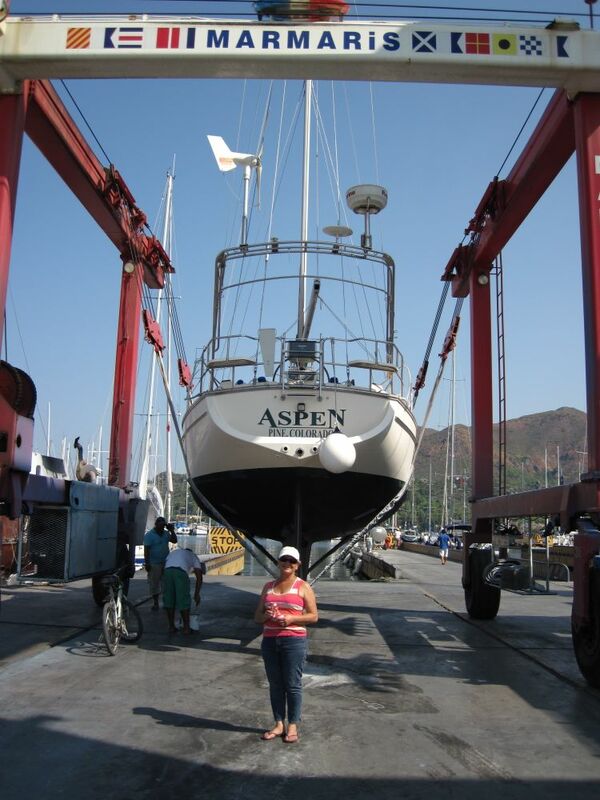 Aspen ready to go back into the water with new bottom paint. Now maybe we can sail faster? 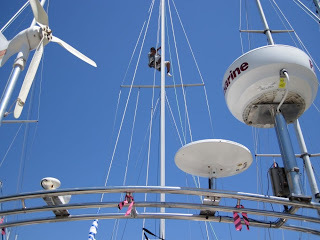 Another view of the rigging that we had replaced. What a job that was. You have to leave that to professionals to do! 105 degrees in the shade with no clouds at all, day in and day out! Wow this is hot hot hot. Aspen is back in the water and we are cleaning her up for the journey ahead. 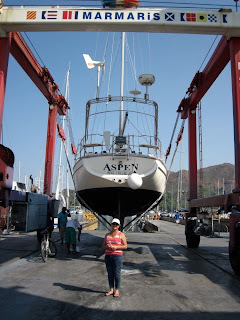 We have new paint for Aspen’s bottom and the new rigging was installed right on schedule too. The Turkish workers that we used are really enthusiastic and like schedules. We like that too! Now we are putting the 150 pounds of parts away that we brought with us, including a portable Honda generator. The generator caused lots of problems in Customs in Turkey. Captain Steve felt like he was in the TV series Locked Up Abroad when the customs officer calmly called him over to look at the x-ray screen. “What is that?? ?”, the armed officer asked at 1:00 AM in the morning at the airport when we landed. Captain Steve looked at the screen and it showed coils of wires everywhere along with many dark objects nestled among the coils. Thinking quickly the jet lagged captain of Aspen said, “hmmmmmmm”. Two days later and without going to jail we had our generator back from customs (after paying a little Turkish lire for the privilege!). 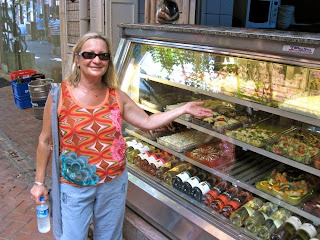 Taking some time away from the boat we are sampling the Turkish delights of mezes and hamams to keep us cool during the day (food and Turkish baths). 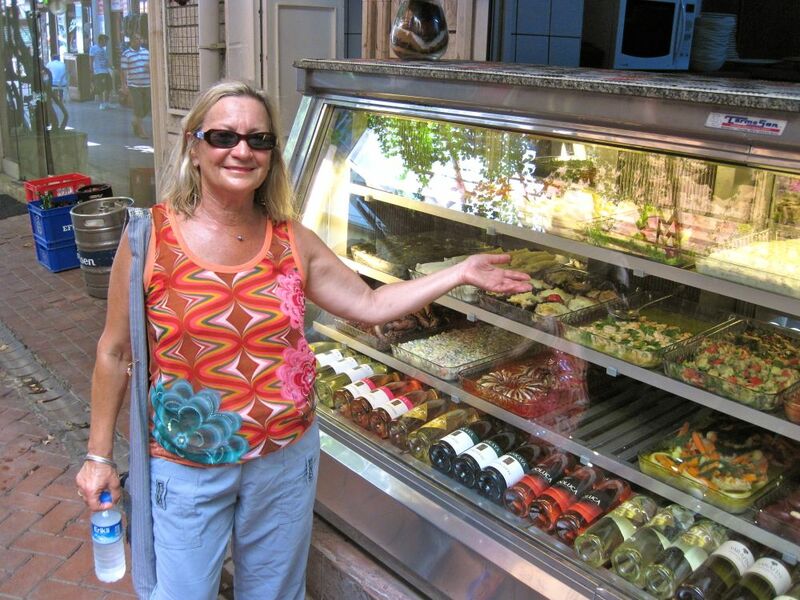 Turkey remains one of our favorite places on this long journey!